The land of volcanoes. Tour to Tolbachik volcano! Flight to the valley of geysers & Uzon caldera!! Bear fishing on Kuril lake. Kamchatka. Flight to the valley of geysers! If the weather is cooperative and if there is place on the helicopter fly to the Valley of Geysers, located in the Kronotsky Reserve. The flight takes about one hour and fifteen minutes, three hours are spent in the Valley and then there is a lunch after which you return to Yelizovo. The whole excursion can take all day though because the weather usually does not clear until late morning. Kronotsky Reserve Local people with the goal of conserving the sable population created this protected area 123 years ago. One of Russia's largest; an oldest preserve in Russia, Kronotsky is a multi-faceted jewel covering 1,007,134 hectares of land and the 3-mile zone of 152 miles of shoreline. The preserve's mountains, glaciers, active and extinct volcanoes, rivers, lakes, islands, beaches, and rugged shoreline give the preserve a variety of ecosystems and remarkable biodiversity. The protected area abounds with wildlife, marine or terrestrial, to watch and photograph. The preserve plays a major role in preservation of Kamchatka's brown bears as it is home to about 750 bruins. Additionally over 2500 of Kamchatka's last wild reindeer live in the territory, along with Steller sea eagles, and Aleutian terns. The helicopter flight to the Valley of Geysers takes one of two routes. The all-weather eastern route heads round the southern and eastern flanks of Avacha volcano, flying at heights of just a few hundred meters above ground. It continues north up a broad valley to the east of the Zhupanovsky volcano. Flying low affords splendid views of the taiga landscape and as this valley is home to many brown bears, they can easily be observed from above. Continuing its flight over the tundra, the helicopter approaches the coast, where a few hunters' cabins lie among the trees; Karymsky and the two Semlyachik volcanoes lie inland to the left. The flight then turns inland up the valley just before the Kikhpinych volcano, and turns into the lush green tributary which is the Valley of Geysers. The western route heads round the western side of the smaller cones of the Arik and Aag, which continue the line of volcanoes northwest from Koryaksky. It then heads across the interior tundra, keeping west of Zhupanovsky, on its way to Karymsky. Often eruptions can be observed while flying over the Karymsky volcano. The active cone is 700 meters high, and stands inside the old caldera; the even older Dvor caldera is truncated as the higher bowl to the north. Just to the south Karymsky Lake lies the Academia Nauk caldera erupting less frequently. Northwards, the flight goes over Maly Semlyachik volcano with its spectacular crater lake of green water. Past the inactive Bolshoi Semlyachik, the route veers slightly right for the Valley of the Geysers. The Valley of Geysers is the only geyser field in Eurasia (apart from the Mutnovsky geyser field) and the second largest concentration of geysers in the world. This 6 km long basin with approximately ninety geysers and many hot springs is situated on the Kamchatka Peninsula in the Russian Far East, predominantly on the left bank of the ever-deepening Geysernaya River, into which geothermal waters flow from a relatively young stratovolcano, Kikhpinych. Temperatures have been found to be 250 °C, 500 m below the caldera ground. It is part of the Kronotsky Nature Reserve. The valley is difficult to reach, with helicopters providing the only feasible means of transport. A Soviet postage stamp from 1966. The "pulsating" geysers of Kamchatka were discovered by a local scientist, Tatyana Ustinova, in 1941. She published her findings fourteen years later, but there was little exploration of the area until 1972. A systematic survey was undertaken in the mid-1970s, and an automatic monitoring system was introduced in 1990. Over thirty geysers were given names; among these was the Giant geyser (Velikan), capable of producing a jet of water reaching up to 40 meters. From the 1980s, the area was promoted across the USSR as one of the tourist magnets of Kamchatka and the Russian Far East. Foreign tourists were allowed into the valley in 1991. About 3,000 tourists visited the site annually. For anybody visiting the Valley of Geysers for the first time, it`s difficult not to fall the impression that he is watching some strange performance – a performance with fantastic scenery, a non-stop show with brilliant and indefatigable actors, directed by a mysterious but infinitely talented Director. The only thing that the ecstatic spectator should remember is to stay away from the “Stage”. 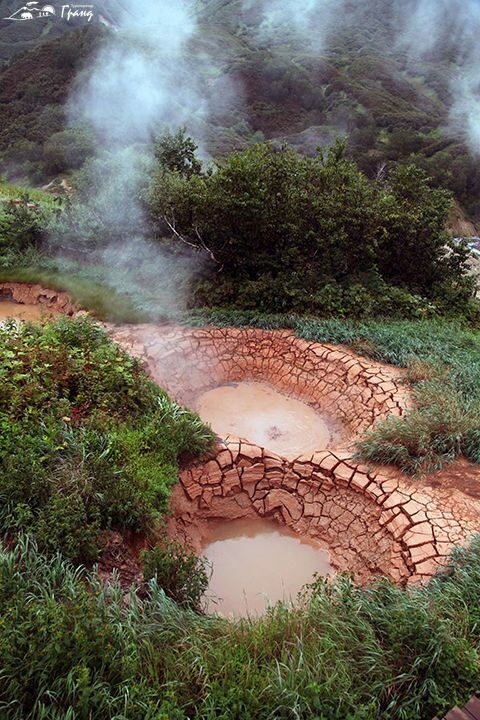 You will have an opportunity, by trying yourself, to effect beautiful picture of geysers. This itinerary takes you to one of the most remote parts of the world. Please also note that weather circumstances may change the day of excursion as to take advantage of good weather. The flight takes about one hour and fifteen minutes, three hours are spent in the Valley and then there is a lunch after which you return to heliport in Yelizovo.